(Phys.org)—ESA's Planck space telescope has made the first conclusive detection of a bridge of hot gas connecting a pair of galaxy clusters across 10 million light-years of intergalactic space. Scanning the sky at microwave and sub-millimetre wavelengths with Planck, astronomers have unambiguously detected a 'bridge' of hot gas connecting two galaxy clusters, Abell 399 and Abell 401. The filament extends over about 10 million light-years and contains gas with a temperature of about 80 million K. At least part of this gas might derive from the warm-hot intergalactic medium (WHIM) - the elusive web of gaseous filaments which is believed to pervade the Universe. The current understanding of cosmology suggests that the Universe is dominated by dark matter and dark energy. The remaining 'normal' matter – or baryonic matter – of which stars and planets are made, accounts for just a tiny fraction of the cosmic budget, less than five per cent. Baryonic matter can, in principle, be detected through the electromagnetic radiation it releases. But there's a problem: the amounts of baryonic matter detected via astronomical observations in the distant, ancient Universe and in the nearby one do not match. Astronomers have struggled to locate about half of the baryonic matter expected to be present in the local Universe. A leading candidate for the location of these so-called 'missing baryons' is the warm-hot intergalactic medium or WHIM. The WHIM is the baryonic component of the cosmic web, a filamentary network of both dark and baryonic matter that is believed to pervade the Universe. 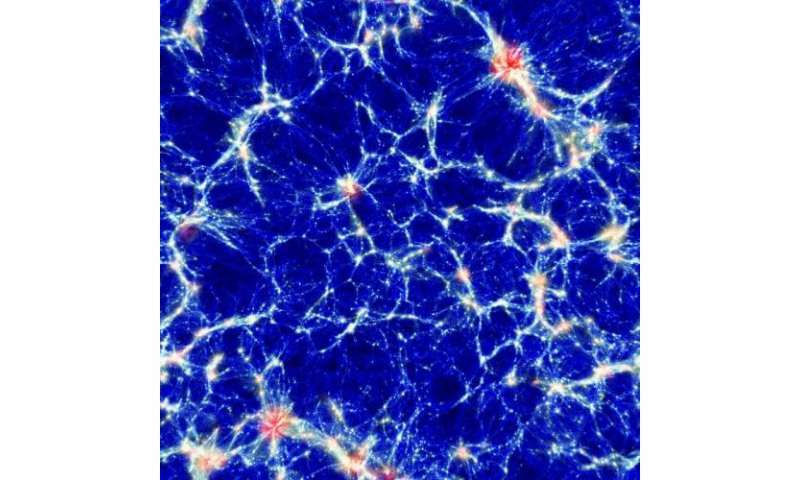 Numerical simulations of the formation of cosmic structure predict that galaxies and galaxy clusters are embedded in the cosmic web, and that the WHIM might account for most of the baryonic matter in the local Universe. This network of tenuous gas ranges in temperature from 100,000 to several tens of millions of K and due to its extremely low density has proved very hard to detect. In the past decade, astronomers have started to collect evidence supporting the WHIM hypothesis, mainly via X-ray observations and optical/ultraviolet spectroscopy. A recent study using data from ESA's Planck satellite has brought a new insight to the debate, opening a new spectral window for the study of the missing baryons based on observations at microwave and sub-millimetre wavelengths. "Although the WHIM is mainly organised in long and diffuse filaments, we expect to find it also in the proximity to galaxy clusters, which are the largest gravitationally-bound structures in the Universe," explains José M. Diego, a Planck Collaboration scientist from the Instituto de Fisica de Cantabria (UC-CSIC) in Santander, Spain. "Planck can detect galaxy clusters across the sky because the hot gas that fills them imprints a characteristic signature on the Cosmic Microwave Background known as the Sunyaev-Zel'dovich effect," Diego adds. "Based on the same principle, Planck could be sensitive to gas from the WHIM, too". Astronomers in the Planck collaboration have been exploiting the Sunyaev-Zel'dovich effect in the search for galaxy clusters. The first results of Planck's hunt for these gigantic cosmic structures were presented in 2011, along with the public release of an extensive catalogue of clusters. Careful analysis of this rich data set is now starting to reveal the properties not only of galaxy clusters, but also of their surroundings. "Detecting the WHIM via the Sunyaev-Zel'dovich effect is extremely challenging due to its low density," comments Juan Macias-Perez, a Planck Collaboration scientist from the Laboratoire de Physique Subatomique et de Cosmologie in Grenoble, France. "The best chance to detect it is to look at the regions between pairs of nearby galaxy clusters that are interacting with one another: as they approach each other, gas in the inter-cluster region becomes denser and hotter, hence easier for us to spot," he adds. With this aim, astronomers from the Planck Collaboration inspected the catalogue of clusters compiled from data collected by Planck during its first two surveys, and the beginning of the third. "We looked for pairs of clusters which are close enough for a possible intervening filament to be detected, but also separate enough, on the plane of the sky, for Planck to resolve them as individual sources," explains Macias. The astronomers then identified a handful of candidates, which are all at very low redshifts – hence cosmologically short distances – to fulfil these requirements. 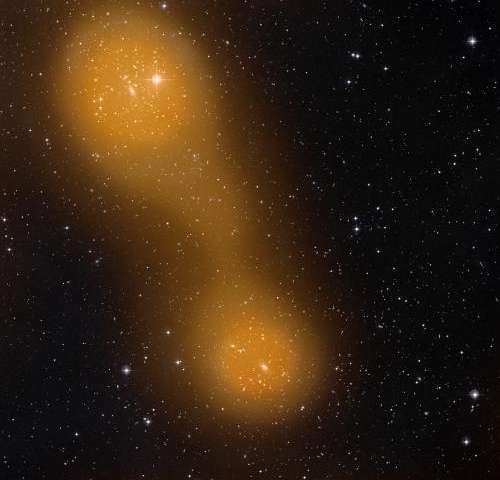 "A careful analysis revealed a 'bridge' of hot gas connecting two of the clusters in the sample: Abell 399 and Abell 401," comments Diego. These two clusters are located at redshift z~0.07 – about one billion light-years away from us. In contrast, the bridge has a length of about 10 million light-years. Hot gas can also be detected via its direct emission at X-ray wavelengths. A previous study of Abell 399 and Abell 401, based on X-ray data from ESA's XMM-Newton space observatory, hinted at the presence of hot gas not only within, but also between the clusters, but the evidence was not conclusive. The result based on Planck data is much more robust and confirms that the two structures are indeed connected by a bridge of material; this also represents the first detection of inter-cluster gas obtained via the Sunyaev-Zel'dovich effect. "By combining Planck data with archival X-ray observations from the German satellite ROSAT, we estimated the temperature of gas in the bridge as about 80 million K," notes Torsten Enßlin, a Planck Collaboration scientist from the Max-Planck-Institut für Astrophysik in Garching bei München, Germany. This value is of the same order as the temperature of gas in the two clusters. Although it may be part of the WHIM, the origin of this inter-cluster gas is, as yet, unclear. "It is still debated whether the gas derives from the WHIM or from the gas that was previously part of the two clusters; numerical simulations suggest that it could well be a mixture of both," explains Enßlin. "Further analysis of the complete Planck data might help to clarify this issue by revealing additional examples," he adds. The astronomers have already identified another promising candidate: the composite system Abell 3391-Abell 3395, which is highly substructured and may in fact consist of three or four clusters. This system exhibits what appears to be a bridge of material linking its various components. Due to the complex nature of this object, a more detailed investigation will be needed to confirm this second detection. "This discovery highlights the ability of Planck to probe galaxy clusters out to their outskirts and even beyond, allowing us to investigate the connection between intra-cluster gas and gas that is part of the cosmic web," concludes Jan Tauber, Planck project scientist at ESA. More information: "Planck Intermediate Results. VIII. Filaments between interacting clusters", is accepted for publication in Astronomy & Astrophysics. The Planck maps from which the cluster data have been extracted will be released to the public in early 2013. Why the filamentary bridge of "hot gas"? Why doesn't this follow gas laws and disperse as "hot gas" should? Probably because it's not "hot gas" at all, this is plasma, A DISTINCT STATE OF MATTER. Not only does plasma organize itself into filamentary and cellular structures, but it will also delivery electric currents across intergalactic distances. What we are observing here is an intergalactic Birkeland current. Sounds like a lot of hot air to me. Just like the solar corona emiting x-rays. What about the recent article about non-thermal x-ray emisions? Theoretical physicists love to talk about fractals -- except when the concept pertains to the scalability of plasmas over enormous magnitudes. Not only is 99% of what we see with our telescopes matter in the plasma state, but we see filamentation of that plasma at laboratory, interstellar, galactic and intergalactic scales. Based upon our observations of laboratory plasmas, we can see that filamentation is associated with charge transfer (electricity) in plasmas. This makes charge transfer an essential inference for explaining the filamentation of HI hydrogen too, which is observed at the 21-cm wavelength and which Gerrit Verschuur observes to exhibit "knots". Providing additional reason to believe it, these knots align with dozens of WMAP hotspots and exhibit critical ionization velocities for the universe's most commone elements -- which is what happens when charged particles slam into neutral gas. Without plasmas, the universe's fractal-like structure remains a mystery. If the two galaxies are each ejecting ion gas, and are now moving away from each other (having had a common origin), they leave a bridge there-between. But this is inconceiveable! They must be moving toward each other. Such is the problem with current thinking. By relying upon the term "hot gas" instead of plasma, confusion emerges. The confusion is that plasma can conduct in three separate modes: arc, glow and dark. Gases, of course, do not conduct unless they are heated up to the plasma state. But, it's been known since we first started sending probes into space that charged particles are common within the heliosphere. We also observe copious amounts of nonthermal "synchrotron" radiation in space beyond the heliosphere -- which we know to be the result of electrons spiraling through magnetic fields. When the term "hot gas" is used instead of hot plasma, it leaves the impression that conduction is only occurring for those hot portions of the plasma interstellar medium. The term "quasi-neutrality" was coined to distinguish neutrality in a plasma from neutrality in condensed matter. The point is that neutrality in a plasma does not mean non-conduction. Conduction is a function of charge mobility -- which is true for all plasmas. Unfortunately, our physics PhD programs have decided to align themselves rather exclusively with conventional notions about plasmas. These notions create a tangible disconnect between our observations of laboratory plasmas and our observations of the interstellar medium. The courses being offered by our universities refuse to acknowledge the existence of these critical ionization velocities. They refuse to carefully explain to students that cold filamentary plasmas are very possibly conducting. They fail to even acknowledge the predicament of Gerrit Verschuur's observations -- that extremely long, tenuous filaments of HI hydrogen observed within the interstellar medium should naturally disperse. What keeps them together? We commonly hear today that, in order to build a "knowledge economy", we must stop teaching students what to believe, and instead focus on teaching them how to learn. This would be a great place to start that practice in earnest, for it's the students who lose. "This makes charge transfer an essential inference for explaining the filamentation of HI hydrogen too, which is observed at the 21-cm wavelength"
"We've known since the mid-50's that the Milky Way does not emit thermal radiation. The radiation mechanism is nonthermal"
So why do these two galaxies have opposite charges that allow for this plasma flow. If it was coming from the outside of these two systems we would see evidence of this and yet there is none. it says it in the article "At least part of this gas might derive from the warm-hot intergalactic medium (WHIM) - the elusive web of gaseous filaments which is believed to pervade the Universe." The EUT states that stars and galaxies are externally powered by birkeland currents, the "cosmic web" shows evidence of those currents. A2G acknowledges that these two are connected, but since there is no "obvious" evidence of the "poles of flowing charges", there is no possibility that there is further inter-connectivity beyond these two galaxies. 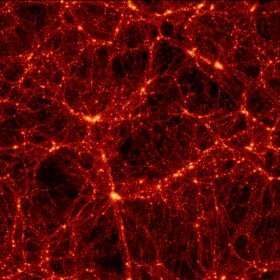 The "cosmic web" refutes that idea, as stated above that galaxies fall within the filaments and knots of the web. The EUT doesn't propose where the currents ultimately originate, however the fact that they are there is supported by the observations. We are living inside a brane, and the brane might even be inside a brain. On a side note, visible in the enlarged view of the image at top are about a dozen asteroid trails (the visible-light image is from the Digital Sky Survey). The large number of asteroids belies the fact that these two clusters lie about four degrees off the ecliptic and are likely members of the main asteroid belt just passing by. Why the atmosphere of gas around the Earth? Why doesn't this follow gas laws and disperse as gas should? Still gonna be November, right? Or are you lying about that too. Seems like a vaguely pertinent question. then plasma physics is likely to have some answers about the observable universe. It follows gas laws. You just don't understand what gas laws are (or under which conditions the laws you are probably refrring to apply under which they don't...as well as which other laws come into play with large amounts of matter on significant scales). Trails fanning out in straight lines, branching off like road networks, pushing dust and particles/rocks out with them travelling those routes over billions of years, with the occasional kink like they're going round a black hole. Just saying.. we'd be naive to assume we're the only life out there or that we would have emerged at the same time as the rest like star trek. Also to assume to perceive to comprehend the pinnacle of technology. But yeah, why not? Gotta throw every idea out there, it's a feasible one, right? If someone knows better I'll take their word for it, but for now it seems quite feasible to me.. many ships would have probably travelled these routes naturally in Type 3 civilizations. You may have missed some important points, so let's review them. 10 million light-year bridge at 80 million K. The root-mean-square velocity of a proton or hydrogen atom at this temp would be 4.4 x10^6 m/s, or 0.0015c. Thus it would take another 3.4 billion years for the gas to extend another 10 million light years should we naively assume that it will remain the same temperature, and ignoring the fact that it's within the gravity well of thousands of galaxies. Is it partially ionized? Certainly. Why you think anyone's arguing any differently is due to your own messed-up psychology... well, that and your complete ignorance of physics. Is it partially ionized? Certainly. That's as far as you need to go to explain the phenomenon. Plasma reacts to EM and is filamentary and cellular, gravity is of little importance and has little effect on electrified plasma. If you weren't completely ignorant of plasma physics you'd know this to be true. How does this fictional gravity well explain the filamentary aspects? Please produce the correct model and math for these supposed gravity wells that produce the observed "cosmic web". How can these filaments extend for many parsecs between galaxies? Do these filaments that are at least 100 times more diffuse than a puff of cigarette smoke create their own gravity wells? Why doesn't dark energy disperse these filaments? Being that you're so well versed in the gravity only theory this shouldn't be a problem for you. And while you're at it, please produce a "gas" that is 80 million K, or even 10,000K to help support your notion that this is indeed a gas. That's where you always get it wrong. Clouds like this do not have uniform charge separation. They are a homogenous mix of positive and negative charge carriers, as well as neutral particles. Individual charge carriers collide and trade charges, but there's no medium to carry charges accross vacuum. At 80 million K, the net motion of the gas is just random collisions. You're not going to see any organized flow of electrons in any given direction under these conditions. The particles that compose this type of structure, are bouncing around and vibrating like crazy in there, but it's several orders of magnitude less dense than what it would take to conduct a current. You don't have charge carriers anywhere near enough to one another to carry current. The high temperature prevents it. The existence of dark matter fibers would support the AWT model, in which could dark matter results from shielding of gravitational waves between massive objects with nearby massive objects. IMO it's equivalent to cosmic string considered with string theory (despite the string theorists are seeking for somewhat different object). This fiber should be formed with mostly low energy neutrinos without charge and it has therefore zero significance with respect to Plasma Universe. Its behavior should be similar to Gregory LaFamme instability, which is modeled here (compare with dark matter fibbers illustrated here). Perhaps the situation is that dark energy has driven away all the gas except these filamanets. Perhaps the space between the clusters is still filled with gas because they shield this space from the effects of dark energy. You see similar effects in star forming regions of planetary nebulea. Thank you for clarifying the fact that you do not understand the characteristics of plasma. For the sake of not portraying yourself as being so sure of your "facts", while at the same time being so remarkably ignorant of the behavior of space plasma, I would suggest you enlighten yourself on said behavior. The sun is composed of electrified plasma. I'm pretty sure that gravity is having an effect on that plasma. If gravity was the primary force involved then I'm curious as to why solar physicists are "baffled" by the near perfect roundness of the Sun. I don't discount that gravity has an effect, however, that effect will be 39 orders of magnitude WEAKER than that of the EM forces imposed upon the electrified plasma. Nice ad hoc guess, the problem lies in the observed "cosmic web". Such an explanation could possibly be used in certain rare conditions where "shielding" could take place. The probability of said shielding creating the filamentary and cellular structure of the entire universe while at the same time causing the entire Universe to expand seems highly unlikely. Being that even NASA acknowledges that over 99% of the "visible" Universe is plasma, disregarding the observed similarities of laboratory plasma and space plasma (filamentary and cellular) seems quite unscientific. The gravity is compressing the matter. Which is creating heat. Which started & maintains the fusion of hydrogen,which is releasing the energy, which provides the thermal pressure, which creates a hydrostatic equilibrium. By the by, the astrophysicists that are baffled by why the Sun being so round? The mainstream scientists aren't so baffled. It's simple physics, the thermal pressure balances the gravitational pressure. Freshman physics. Why doesn't dark energy disperse these filaments? It is a valid question. One that NO ONE knows a certain answer to. The prevailing idea is that it does, but the matter driven era constrained it until the energy driven era kicked in. Started accelerating the expansion we find ourselves in today. The difficulty is in the fact that we're speaking of things unfolding over billions of years. How does this fictional gravity well explain the filamentary aspects? It never ceases to amaze me what a moron cantdrive85 is. Q, your reasoning disregards the fact that 100% of the Sun is plasma, and that plasma doesn't conform to thermal pressure or hydrostatic equillibrium. Once again, electromagnetism drives the properties of electrified plasma, this is a well understood FACT. Here is a link that describes the baffling observations of the "simple physics". Q, your reasoning disregards the fact that 100% of the Sun is plasma, and that plasma doesn't conform to thermal pressure or hydrostatic equillibrium. How silly of me. Of course: There is no God but Plasma and cantdrive is His Prophet. A voice in the wilderness preparing the way for the Son, Peratt and the Spirit, Hannes. And the Pope, His vicar on earth Arp. Dead scientists, crackpots and gad-fly wannabes. Help me here, where is all this electricity in the Sun coming from? And will my tin-foil hat protect me from it? Really? With as much ignorance(willful ignorance no less) he's already shown nothing he says surprises me anymore. The phenomenon of the "gravity well" (if it exists) seems to be a bit misleading, wouldn't it be more accurate to called it a "gravity bubble"? I always see the "artist's impression" of a gravity well dipping below the equator of the body. In reality it should have a mirror of the "well" to create a bubble. Why don't I ever see such a depiction? Help me here, where is all this electricity in the Sun coming from? In an electric galaxy the currents flow in along the galactic arms (powering the stars along the way) and the current exits the galaxy along the collimated jets that exit the poles of the galaxy. Being that the Plasma Universe is scalable, the same action will take place on a solar level. The electric energy will flow into the Sun along current sheets (described by NASA) and a majority of that energy will exit through similar polar jets (discovered by Ulysses). Don Scott explains it in much more detail in 'The Electric Sky'. I have a couple of issues with your statement. You mention the bubble in which gravity holds the solar system together, "solar wind combined with the magnetic field". I'm not sure if you realize the solar wind represents the Sun's radial electric field. The solar wind readily over powers the Sun's gravitational field, not only does it escape the Sun, but it accelerates as it moves away from the Sun, the standard theory has difficulty explaining this (actually, the solar wind is not predicted by the standard model). I'm not sure if you realize the solar wind represents the Sun's radial electric field. I'm not sure if you realize the Easter Bunny is sitting on your head. Naaa, that wasn't much help. You didn't say anything at all about whether my tin-foil hat will offer any protection from the plasmas. Let me ask another really stupid question. If this plasma and electric force is so much stronger than gravity,,, and if on average throughout the universe the positive charges equals the negative charges shouldn't 1 added to -1 equal zero net? And even though the electromagnetic force is so much stronger than gravity, it works in two directions, so half of the charges are pulling, and half of the charges are pushing. But with gravity, you have a force working only in one direction, every body pulls. Shouldn't after 14 billions of years all the negative charges have met up with a positive charge and neutralized? The battery gone dead so to speak? Something is recharging that battery. What keeps the generator spinning? In AWT the dark matter fibers are formed mostly with neutrinos. Their dynamics is very different from gravitating or charged bodies. It belong into realm of gravitoelectromagnetism. The gravitomagnetism is formally similar to Maxwell equations or Navier-Stokes equations. It means, some aspects of the dynamics of dark matter fibers can be similar to plasma, but it actually works at quite different dimensional scale. Every similarity between Birkeland currents and dark matter flow, between plasma fibers and dark matter fibers is just a homology, not an analogy. The neutrinos are driven with weak leptonic charges and their collective motion rather correspond the neutral current inside of atom nuclei. Also, the speed limit imposed on gravity in an GR universe would in reality produce unstable orbits. Gravity must occur in a near instantaneous manner for stable orbits. Earth must orbit where the Sun is now, not 8 minutes ago. In the 8 minutes it takes light to arrive at Earth, the Sun will have traveled approx 65,000mi "south" of it's south magnetic pole, for orbits to remain coherent the force must act instantaneously for all planets within our solar system. Also, there are NO circular or elliptical orbits in our solar system, none, zero, zilch. Every orbit in our solar system is HELICAL due to the relative orbital motion of the Sun about the galactic center. The helical nature of orbits suggests an instantaneous electromotive force is acting upon the system to keep it coherent. The Sun also seems to follow a helical pattern in it's orbital trajectory, which would support that it is "cranking" it's way along a helical filamentary birkeland current. Speaking of Neptune and Pluto, it takes between 4-7 hours for sunlight to reach those planets. The Sun will have traveled up to 3.4 million miles in that time, yet Pluto (which travels that same distance plus the distance it travels within it's orbit) remains fix to the ecliptic, there cannot be a delay in the forces involved. The Einsteinian GR universe demands our reality is similar to Wile E. Coyote's reality, that one which you run off a cliff and gravity doesn't act until the light "realizes" it has arrived at the secondary body. We know from experience that the reaction is instant, you step off, you fall. "Most people today still believe, perhaps unconsciously, in the heliocentric universe..."
Comets exhibit all the characteristics of a charged body orbiting in an electric field. The 'Electric Comet' has produced some of the best evidence of the verification of the EUT, many of the predictions were far superior to those proposing fluffy snow-balls. The Einsteinian GR universe demands our reality is similar to Wile E. Coyote's reality, that one which you run off a cliff and gravity doesn't act until the light "realizes" it has arrived at the secondary body. We know from experience that the reaction is instant, you step off, you fall. If this is so, why I wonder is the "Einteinian GR universe" so successful in PREDICTING the exact location of of the all these erratically plasma driven bodies. The two most successfully tested and verified big items in physics are 1) Quantum dynamics and 2) General relativity. If they are so wrong, why are their predictions so right? Lucky guesses I suppose you'll say. By the way, the coyote's step? The gravity acting on him doesn't "turn on" when he steps off. It was there along, but the air he steps into is less dense than the rock he's stepping off of, hence he begins to fall. Please tell us about ONE experiment shows that gravitational fields are not constrained by light speed? I was unaware that GR predicted the helical orbits that the planets and moons conform to. It provides for a better model than GR a directly explains the observed helical orbits. You are trying to be funny. Right? The fingerprints of the Creator guy? No wonder no one with a real interest in science has any respect for anything you might say. My link is not to a fanciful pdf file, it's to his actual web page. Who peer reviewed his work? Pat Robertson? Dude, you're talking about helical orbit if viewed from a fixed point in the universe...find one. The concept of all the bodies in the solar system moving right along through the universe as a group is quite beyond him. But then, he also has trouble with idea of anything being conserved. Mass-energy, momentum, charge,,,, none of it could possibly be conserved, plasma doesn't allow for that. I'm sure you're familiar with Monseigneur Georges Lemaître, priest and scientist, and founder of the Big Bang theory. Hannes Alfven once stated; "I was there when Abbe Georges Lemaître first proposed this [Big Bang] theory. ... There is no rational reason to doubt that the universe has existed indefinitely, for an infinite time. .... It is only myth that attempts to say how the universe came to be, either four thousand or twenty billion years ago." Isaac Newton, as Wiki states, "Although an unorthodox Christian, Newton was deeply religious and wrote more on Biblical hermeneutics and occult studies than on science and mathematics." So as it seems, many of the individuals who work in science don't fall into the same myopic mold you insist they must. Myself, I believe in god as much as I believe in the BB, and that is nil. But I'm also not afraid to ponder other POV, especially those which give an actual mechanism for gravity rather than a "gravity well" that just does it. If the mathematics are sound, and it gives a mechanism that can be quantified with REAL physics, then it is a viable option regardless of his beliefs. In this connection it may be interesting, that the AWT does prefer neither Big Bang theory, neither steady state Universe in their entirety. For example the famous astronomer Laura Mersini believes, that the observable Universe is something like the giant quantum wave which travels from place to place and it ignites a nucleosynthesis here - well, like the giant fluctuation of immensely dense gas. Currently it seems, that the Big Bang model will face more troubles in near future, but the inhomogeneous universe model actually leads to sorta mixture of both approaches, which are becoming indistinguishable each other from general perspective. Because random means just - random, i.e. without any proffered mechanism. It's amazing to see how much fear mainstream science has for Plasma in space. I can only hope that most of these egotistical, narcissistic entities are around when the logic of plasma smacks us all in the face (no pun intended). I can only imagine what will be said to save face then. According to Mainstream "Scholars", the earth was once believed to be flat, earth was believed to be the center of the galaxy/universe and the list goes on. Each of those cackled hysterically at the ideas we now accept to be fact and those who supported them were forced to change. Change is imminent. Einstein himself noted that his theory of relativity was missing something... therefore all that is grounded on the theory are also 'missing' something. Fact, like it or not. I can only hope that most of these egotistical, narcissistic entities are around when the logic of plasma smacks us all in the face (no pun intended). Not to worry, there was no pun there, intended or otherwise. By the By: Don't worry about me getting smacked in the face by the God of Plasma. I have a tin-foil hat and copper chain-mail underwear to protect me. It happened with epicycles, and it'll happen with Einstein's metaphysical nonsense pervading science today. One day history will look back upon the "standard theory" just as we see the flat earthers, with incredulity and contempt, the difference being we've got the tools to know better. One day history will look back upon the "standard theory" just as we see the flat earthers, with incredulity and contempt, the difference being we've got the tools to know better. If I were you, I would be less concerned with what the future historians might think, because apparently you seem not to know that we are in the 21st century. You have a long way to go. By the By: You do not have "the tools to know better". Your tool kit is sorely lacking. And the only way you might change that is begin at the beginning. The problem with you "internet" gurus, is you just don't know the fundamentals. It takes effort to learn the basics. Much like the person who wants to be a brain surgeon but doesn't want to spend the time to learn high school biology. You are like the guy who goes to the bookstore when he wants to learn "the calculus", picks out a book, memorizes the jargon, but yet doesn't think it's of any benefit to first learn rudimentary algebra. It's amazing to see how much fear mainstream science has for Plasma in space. I'm not proponent of mainstream physics and I don't consider this model naive and obsolete too. The Plasma Universe cannot estimate, which portion of matter is ionized, so that the amount of electromagentic effects is freely adjustable parameter in this model. And Plasma Universe proponents tend to confuse the effects of classical plasma physics with effects gravitoelectromagnetism, which appear similarly but which manifests itself at large scale and which belongs into "new physics". They cannot realize, that the majority of matter in the Universe has no EM charge at all (dark matter formed with neutrinos). The dark matter fibers have nothing to do with plasma fibers and they consist of EM neutral particles. LOL as soon as I saw the title of this article, I knew the looney tunes would be out in full force. I despair at the utter lack of scientific understanding displayed by the bulk of posters on this science site. ....for sure.....the "flat earth society" has graduated to the "flat universe society" leading to their inability to comprehend the math of the basics of the principles of Conservation of Energy, resulting in misguided beliefs that "infinity" exists somewhere inside a finite universe.